Carmel City Center is pleased to announce the expansion of Software Engineering Professionals (SEP) operations in Carmel with the opening of the new SEP Product Design Studio. Located at 836 S. Rangeline Road in the Nash, the new SEP Studio is an immersive, collaborative environment to assist in the development of software products and information systems for businesses. SEP is a software product and design company that builds products for global, midsize and small companies. The SEP Product Design Studio provides companies with a space that is designed to work alongside the people who are actually building the product or trying to solve a business problem. The new space will give companies a dedicated place for discovery sessions all the way to testing of the product. “The Nash building was a great location for us. 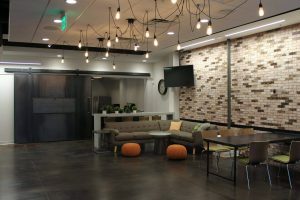 It’s just on the other side of the Monon Trail from our main office and has so many amenities nearby that makes it a perfect place for us to retreat to when are hosting workshops with our clients,” said Jeff Gilbert, Founder and CEO of SEP. Whether it is helping a race car engine manufacturer design aerodynamic modeling software, developing software for a new generation of tractors, or assisting a medical device company in creating a diabetes management mobile application, the new SEP Product Design Studio will help companies build better products for their customers. “We are excited to have an extension of SEP in the Nash and support the growth of a local business in our community. The Product Design Studio in the Nash is a great addition to the mix of businesses at Carmel City Center,” said Melissa Averitt, senior vice president at Pedcor Companies. SEP Product Design Studio is located in the Nash at 836 S. Rangeline Road. Surface parking is available in front of the Nash along Rangeline Road and behind the building to the west. Started in 1988 and headquartered in Carmel, Ind., Software Engineering Professionals (SEP) was created by four Rose-Hulman Institute of Technology graduates. SEP is one of Indiana’s largest software development firms with more than 100 employees. SEP partners with companies to develop software products and information systems that solve complex problems and building products that impact people’s lives. SEP serves Fortune and Global 1000 clients as well as mid-sized and startup companies. The company is 100% employee-owned through an Employee Stock Ownership Plan (ESOP) and has made the Indiana Chamber of Commerce’s Best Places to Work list for seven consecutive years (2010 ranked #1). To learn more, visit www.sep.com.